Open your bet-at-home account here in OnlineBettingAcademy and win more! 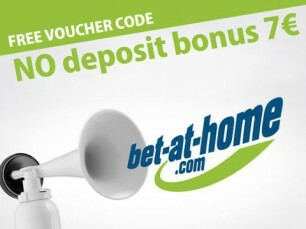 You'll get a free voucher code of 7€ to try and bet on bet-at-home without having to deposit. You'll also win +100 Academy points that will unlock you several exclusive teaching contents all over the Betting Academy website. The bookmaker bet-at-home is offering free 7€ Voucher Code to all those new acounts opened through our links/banners. And you'll still be able to get the regular bonus when you make the first deposit on bet-at-home. Those two bonus are comulative and are available to our members: you may use the 7€ Voucher code no deposit bonus and after that, when you make your first deposit you'll get the regular bonus of 50% of the first deposit up to 20£, 25€, 50€ or 100€ depending or what country are you from. The third incentive is the 100 Academy Points that you'll receive upon your first real money deposit on bet-at-home. No deposit bonus: Voucher code 7€ free! 3. Then just wait at least 3 days for us to verify your account had been open here, and you'll receive Private Message here on Academy with your 7€ voucher code to redeem on bet-at-home whenever you want! Costumers in these countries are excluded from this voucher promotion: Turkey, Israel, USA, France, Spain, Greece, Romania, Denmark, Hungary, Portugal, Mexico, Belgium, Russia and Bulgaria. This bonus is limited to one 7€ voucher per person, family, household or computer. By suspicion of abuse via multiple registrations (fictitious accounts, game communities) or balance betting, bet-at-home.com reserves the right to remove the bonus and any resulting winnings. Notice: the voucher codes are distributed directly by our Academy staff, therefore you should ask us any questions regarding this special offer (don't ask on bet-at-home costumer support). We send the 7€ voucher codes manually, so that may take 3 or more working days, please be patient. The value of the voucher must be rolled over 3 times with minimum odds of 1.50 (for single as well as combi bets with final odd higher than 1.50). 3. You'll get instantainily the bonus of 50% of your first deposit credited on your betting accoung (up to 20£, 25€, 50€ or 100€ depending on your location)! 4. After your first real money your account will be approved here on academy, and you will receive 100 academy points (very usefull to level up and to open new functions and new contents, as well as to get your prizes here on the Academy Shop) - wait a few days because this is a manual procedure. The value of this first deposit bonus must be rolled over 5 times with minimum odds of 1.70 (for single as well as all combi bets) within 90 days prior to making a withdrawal. This is a shor summary information of the first deposit bonus, so you must read the full terms and conditions on bet-at-home website.